If sacred cows make the tastiest hamburgers, as the far-out hippie hell-raiser Abie Hoffman infamously proclaimed back in the 1960s, then the 80,000-square-foot meat-processing facility operated by Cardinal Meat Specialists Ltd. in Brampton, Ont., is a veritable sacred shrine to the virtues of continuous product innovation, progressive manufacturing prowess, and world-class packaging excellence that have enabled the family-owned business to evolve into one of the Canadian meat industry’s leading powerhouses and pioneers. “We have been growing by 20 to 30 per cent annually over the last six years, enjoying a real hockey stick-like growth curve,” says the company’s affable and articulate chief executive officer Brent Cator, a third-generation owner of a thriving meat business that has grown exponentially since its humble origins as a traveling meat wagon selling raw cuts of meat door-to-door in and around the mostly blue-collar community of Bowmanville, Ont., about an hour’s drive east of Toronto. Nowadays specializing in producing premium-quality fresh and frozen meats for numerous clients in the Canadian foodservice and retail markets from coast to coast, Cardinal today employs over 100 people at its brand new, state-of-the-art, GFSI (Global Food Safety Initiative)-certified production facility that, according to Cator, houses some of the most advanced and sophisticated process technologies ever seen in the fiercely competitive burger industry that, contrary to popular perception, largely operates on razor-thin margins. 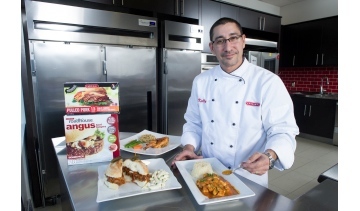 Cardinal also operates a smaller, 14,000-square-foot sister plant in nearby Mississauga—employing 40 people to make kettle-cooked, heat-and-serve meat cuts. All told, the company processes about 40 million pounds of meat per year to produce a diverse assortment of high-quality meat products—ranging from raw burgers and sausages to pre-cooked ribs and roasts—that its customers can’t seem to get enough of. 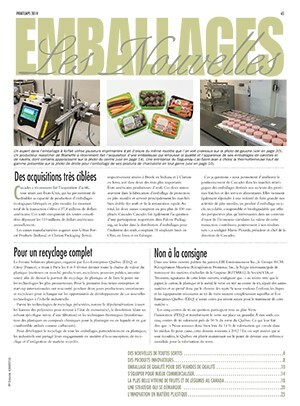 The newly-purchased Repak RE 20 horizontal form-fill-seal packaging machine manufactured by Reiser can handle a broad range of meat products, shapes and species to provide the Cardinal operation with high levels of throughput and operational flexibility to turn raw meat into finished products in a space of about 20 minutes. “We currently produce about 200 different SKUs (stock-keeping units) for foodservice and retail markets, and we expect that number to grow strategically in the very near future,” Cator told Canadian Packaging during a recent visit to the impeccably clean and tidy Brampton facility that’s currently gearing up for a major new retail product launch both in Canada and the U.S.
For a company currently enjoying annual sales of about $130 million, cashing in on the current burger renaissance unfolding across the North American restaurant scene and at the retail shelves seems like just rewards for its proud track record of uncompromising food safety and continuous product innovation—aptly backed up by genuine commitment to leading-edge R&D (research-and-development), formidable manufacturing competence, and a profound understanding of marketplace trends and needs that often positions it well ahead of the competition. “We were the first multiple-species meat-processing company in the country to earn HACCP (Hazard Analysis and Critical Control Points) certification for food safety,” points out Cator, whose hands-on involvement in the family meat business stretches back to his teenage years. “We were also the first to install a DNA analysis system for microbiological detection of contaminants about 15 years ago, well before the Canadian and U.S. governments had the technologies,” he adds. “And we were the first in Canada to start using near-infrared lighting technologies for fat, protein and moisture analysis. 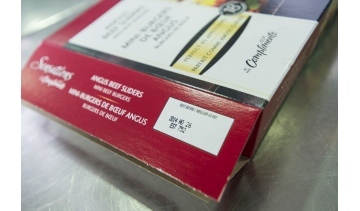 “There are other companies doing that, yet we were always the first in Canada’s meat industry to employ first, second, third and fourth generations of these technologies at our plant for all protein species,” says Cator, citing the company’s unwavering commitment to “continuous innovation and reinvention” as a key driving force behind Cardinal’s remarkable rise through industry ranks in terms of revenues, market share and geographic reach. “My grandfather started out by selling raw meat door-to-door out of the back of his salt truck, and then reinventing the business by opening up a butcher shop,” relates Cator, who graduated with a business major degree from the University of Western in London, Ont., in 1985. “My father then reinvented the business when he took over by targeting the foodservice market and becoming a food ‘purveyor,’ as it was called back then. 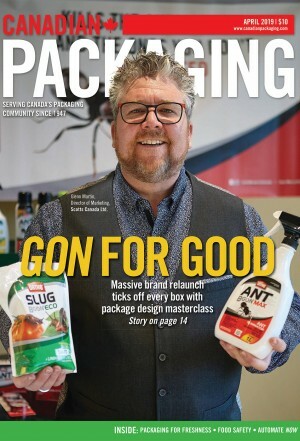 “My brother then reinvented the business again years later by extending our presence into the retail segment in a major way, thereby becoming a ‘branded’ company, with our Cardinal Roadhouse brand, which launched us into doing increasingly more advanced and sophisticated packaging,” Cator relates. “Today, the foodservice and retail sectors account for about half of our business each, and that’s the way I like to keep it,” Cator states. “We have a loyal and diverse customer base of six to seven major customers on both the foodservice and the retail side, with each one accounting for roughly the same volumes as the other, as well as a very wide-reaching distribution for independents,” Cator relates. “And that is all by design on our part: Having that kind of stability is key in this business for sustained growth. “The great thing from the customers’ standpoint is that they get the feature benefits of both types of product we make,” divulges Cator, who is also a past president of the North American Meat Association (NAMA). This versatility has enabled Cardinal to maintain and strengthen a key competitive edge for its high-volume grinding operation, with the company scooping up the 2013 Innovation Award from North America’s leading foodservice distributor Sysco Corporation, complementing the 2012 New Product of the Year award from the U.S.-based National Provisioner magazine, for its Revolution Burger product line—made with certified Angus Beef using Cardinal’s proprietary, leading-edge ‘Natural Texture Forming’ (NTF) process. “We are the most specialized and the most diversified provider in the Canadian market when it comes to burgers,” Cator asserts, “and that’s all built on the many different technologies and capabilities that we have evolved over the years. “Technology has dominated the growth of our burger division’s business in the last three years to such an extent,” says Cator, “that I am fully confident in saying that our company is the leading innovator and a food safety leader in the Canadian meat industry. “And when I say we lead in food safety, I mean we lead in all aspects of it,” Cator asserts. “For example, we purify the air throughout the facility on continuous basis, which is not something you will find in most meat plants,” says Cator, describing the strict sanitation and hygienic regime faithfully observed at all times at both plants, Cardinal opened up its newest facility in 2011 to accommodate rapid volume growth and to provide additional room for its proactive R&D efforts, including a fully-equipped, professional on-site test kitchen employing a full-time chef to develop delicious new products for the meat-loving public. 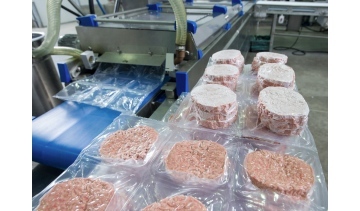 Line workers prepare the freshly-ground burgers entering the high-speed Repak RE20 vacuum-sealing machine to be individually-sealed or multipacked in the high-barrier rollstock plastic film manufactured by the Cryovac division of Sealed Air Corporation. Moving to the new plant has also enabled Cardinal to fine-tune its ‘lean manufacturing’ process with well-designed plant layouts that stress operational flexibility and a true JIT (just-in-time) manufacturing mindset. “The Brampton plant’s grinding operation has five primary lines, three with nitrogen freezing, and every single line can do what every other line does,” Cator explains. “Because these highly flexible high-speed lines are completely interchangeable, it means that a customer’s production order is never down just because one of our pieces of equipment is down. 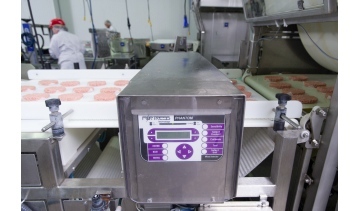 “When we have all the lines going, it adds up to about 1,500 burgers a minute, and we run that continuously for 18 hours a day, five days a week—and seven days when needed,” says Cator, stressing the importance of throughput speed, as opposed to sheer volume. As Cator says, “You may have a huge blender that grinds out 10,000 pounds of meat an hour, yet if your downstream machines can only form 3,600 pounds of meat per hour, then all you’re really doing is creating inconsistencies in your product. The company’s success in the burger category naturally sets a high bar for all of its other product lines, says Cator, noting that Cardinal is also one of the country’s leading manufacturers of non-meat veggie burgers—marketed under the Cardinal Select brand name in retail markets—with a strong presence and capabilities in specialty markets for Halal and all-organic meat products. 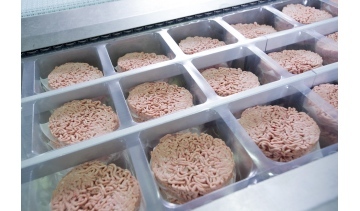 “We process just about every type of animal protein to meet the demands of our customers,” says Cator, “including specialty products like bison burgers and lamb burgers. 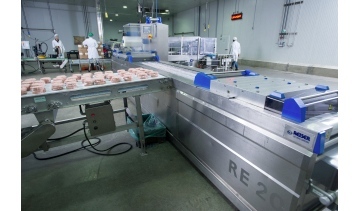 “Our flexible production lines can deal with a very broad range of species to produce many unique varieties, including stuffed burgers with inclusions ranging from veggies to cheeses and other proteins such as bacon,” he expands. “We are able to deal with segregation requirements for Halal and organic meats, along with cooking ground or whole-muscle pork, beef, turkey and chicken—including both fresh and frozen,” Cator relates. Such versatility has made Cardinal a much sought-after producer and supplier for many store-brands of most major Canadian grocery retailers, notes Cator. He proudly cites the Private Label category Grand Prix New Product Award of the Retail Council of Canada (RCC) given earlier this year to the President’s Choice Free From Angus Beef Burgers brand, which Cardinal produced for Loblaw Brands Limited using the aforementioned ‘revolutionary’ NTF process. “The reason it’s called the Revolution Burger is because it really is revolutionary insofar as dramatically changing the market,” says Cator. 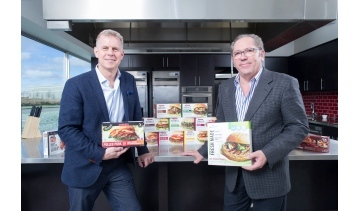 “Winning all these awards really validates what we have done with our NTF technology,” says Cator, adding that the NTF burgers—first launched about three years ago under the Sobey’s Sensations store brand—now account for over half of all burger grinding volumes at the Cardinal plant. “We sought out some technologies widely used in Europe and combined them with some North American know-how and our own in-house R&D to develop this new process,” says Cator, citing buoyant growth for the company’s Butcher-style foodservice burger brand across Canada. Manufactured by Fortress Technologies in Toronto, the high-speed Phantom series metal detection system above is one of several high-accuracy product inspection technologies employed throughout the Brampton facility to ensure optimal product quality. “Our zero-pressure forming method really falls into the whole current trend of minimal processing and more natural products,” he explains. “Because there is no pressure, you end up with a fresher-tasting product that looks like it just came straight from the grinder, with excellent bite and ‘pebbly’ texture, and good moisture retention that ensures a very juicy burger that most people would think was prepared in the back of a restaurant. “The fact is that what we do with these burgers at the plant are things that you could not replicate in the back of the restaurant—particularly in respect to food safety,” Cator points out. “Many consumers may think that the safest burgers are ones made in the back of the restaurant or at a butcher shop and the reality is in fact completely the opposite, as these places are not deep-cleaned and sanitized nightly like ours. “As a GFSI-certified facility, we have all the systems in place to make sure our customers get exceptionally healthy, indulgent and safe burgers. “Being able to make burgers that taste like they just came from a butcher in a high-speed environment is a real competitive edge for Cardinal,” Cator asserts. “Restaurants love the speed of service they get with NTF Burgers. “It cooks faster and more evenly-giving them faster table turns—while their customers get to enjoy the natural taste and texture of a product that tastes like something their mom would make,” he chuckles. Typically running a two-shift, five-day production schedule over the slower fall and winter months, Cardinal significantly boosts its output to full capacity during the busy March-July barbecue season—hiring up to 100 seasonal workers to accommodate an around-the-clock, seven-days-a-week schedule. As busy as that sounds, things may get even busier next year as the company proceeds with the launch of yet more revolutionary product lines to add to its burgers and slow-cooked products. Advanced further-processing equipment developed by leading manufacturer Marel forms an integral part of the upcoming launch of a brand new range of high-quality APP (advanced protein-portioning) products at leading Canadian grocery stores nationwide. 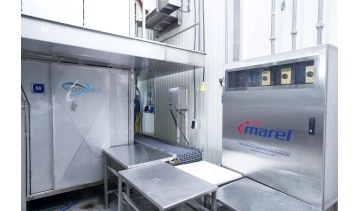 The planned expansion is the result of the company’s new proprietary APP (Advanced Protein Portioning) technology, which Cator says Cardinal installed in partnership with leading global food-processing equipment manufacturer Marel over a period of about six months. 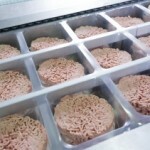 Using Marel Townsend’s high-tech further-processing machinery, the APP processing method enables Cardinal to produce very diverse, fully-cooked and fully-sealed, pre-portioned single-serve meat products ranging from burgers and sausages to three-dimensional product like chicken breasts in their natural shape. “We are very interested in growing our business in the off-season times of year, and this APP technology will help us achieve that goal,” says Cator, adding the first wave of new APP products should be hitting the Canadian retail shelves in the spring of 2014. “Each product made in APP is pre-portioned to what a consumer would eat in a single meal, unlike the kettle-cooked pieces that are more likely to be divided at the family table,” says Cator, noting the Cardinal plant is actually one of Marel’s designated ‘global innovation partner’ sites. Once up and running, the APP line will be able to process between 5,000 and 6,000 pounds of meat products per hour, according to Cator. To ensure a smooth and successful APP production startup, Cardinal recently purchased a brand new, high-performance Repak RE20 horizontal form-fill-seal (H/F/F/S) machine manufactured by leading global food processing and packaging machine-builder Reiser of Canton, Mass. “We have purchased four Repak systems in the last six years,” Cator reveals, citing the equipment’s “exceptional flexibility” and a wealth of value-added features contributing to the plant’s lean and flexible manufacturing strategy. 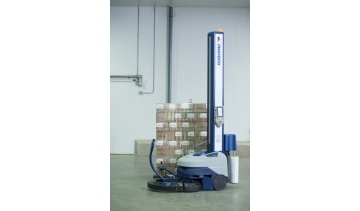 The model Robot PVS stretchwrapping machine manufactured by Robopac provides the Cardinal plant with a highly mobile and flexible stretchwrapping system that can be easily wheeled over to any one of the plant’s production lines as needed, with the on-board touchscreen control panel facilitating easy startup and operation. Although Cardinal took all due diligence in evaluating available equipment options from other packaging machinery suppliers, Cator recalls that the sales people at the manufacturer’s Reiser (Canada) Co. subsidiary in Burlington, Ont., simply made him an offer he could not refuse. “What tipped us over the edge was Reiser telling us that if we bought their equipment and it did not exceed our expectations after a month, they would take it out for us at no charge. “Naturally, we kept the equipment because it has performed so well for us,” Cator relates. 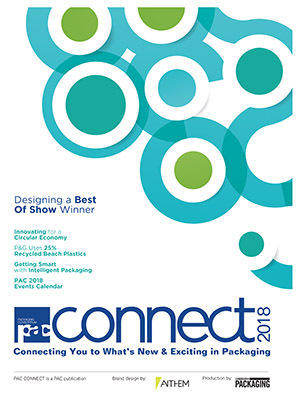 “Reiser has been a tremendous partner for us, providing us with the packaging flexibility requirements we need—be it an easy-peel top, pre-perfed film, using large flaps or individually-portioned pockets, whether we want to do labels on top, bottom or sides, or whatever other packaging features we want to implement. “These are all important points of differentiation that our customers are looking for, primarily from the convenience and speed-of-service standpoints,” he explains, “and Reiser was able to deliver all that by installing the new Repak in just six weeks, rather than the 12 weeks that they usually require for delivery. States Cator: “Packaging plays a key role in what we do at Cardinal, and I expect that in the next few years packaging will become one of the biggest differentiators both at retail and restaurant level. “It’s not just about product quality and integrity any more: it’s also about the flexibility of making that product convenient and stand out on shelf. “This is crucial in the new market environment where customers expect minimal amounts of physical packaging, yet still require the functionality, with much higher convenience and higher value in terms of how the product stands out on shelves,” says Cator. 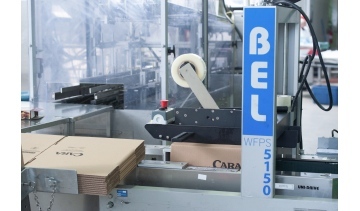 The Brampton plant’s case-packing operations are capably handled by the BEL model WFPS 5150 forming/taping machine working with high-quality corrugated shipping cases manufactured primarily by Norampac. 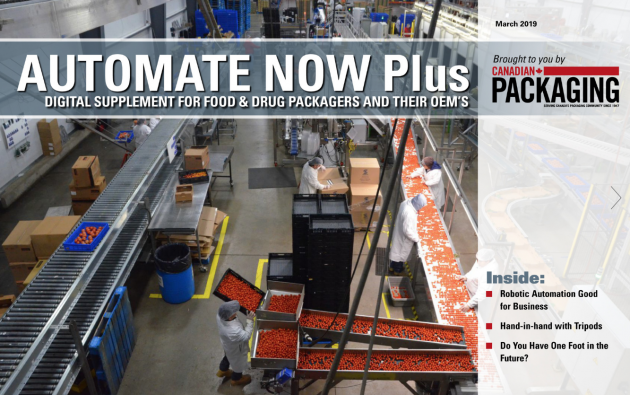 This emphasis on flexibility extends right into the plant’s end-of-packaging operations, which are currently served by Robopac’s innovative, fully-mobile and fully-automatic model Robot PVS stretchwrapper. The sleek and compact machine circles around the palleted loads on wheels to apply the exact amount of stretchwrap film needed to secure the load in place, automatically adjusting itself for height and all other load dimensions and variance on the fly. 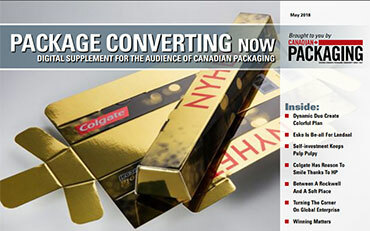 “It doesn’t need to be nailed to the floor, which is really important for a highly flexible operation like ours,” says Cator, who impulsively purchased the robotic stretchwrapper from Robopac’s Canadian distributor Jean Cartier Packaging Inc. right after seeing the system’s live demo on the show-floor of last year’s PACKex Toronto national packaging exhibition. “When you’re using different line configurations, you want to be able to move it to different spots within the plant, and this stretchwrapper allows us to do just that where we want it, when we want it,” says Cator. 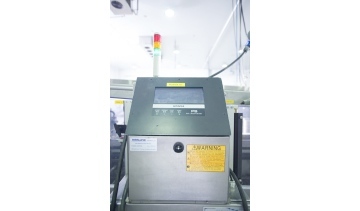 Supplied by Harlund Industries, the Hitachi PB series continuous small-character inkjet printer is used to apply lot code data and other required product information onto the designated white space of the folding cartons. A highly innovative, high-speed vertical conveyor system (VCS) completely developed and assembled in-house. “We actually built, designed and patented the system, which can bring the product down at about 300 IQF (individually quick-frozen) patties per minute through the metal detector with perfect alignment,” says Cator, who recently sold the VCS patent to a prominent machine-building company. Folding cartons printed by leading Canadian boxmaker Boehmer Box LP. 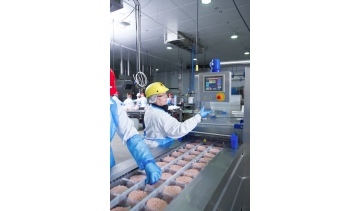 “Most meat plants require a lot of floorspace to bring all those patties to packaging stages via horizontal conveyors,” notes Cator, “whereas our VCS does it all in a four-by-four-foot area. “It’s just one of many things that we do in an innovative way,” says Cator, adding the company houses a number of similar patented inventions, developed in partnership with suppliers and Cardinal’s own dedicated staff, that give it a big leg-up on the competition. As Cator relates: “We have developed a new tagline for our upcoming launches, ‘You can with Cardinal!’, to assure our customers that we’ll do whatever it takes to help their business. “At the end of the day the burger industry is really a pennies business,” Cator remarks. “It’s a very competitive industry, with a lot of consolidation and a lot of failures all around, so the biggest opportunities for growth are all about taking market share away from the competition, which is an important driver of all our innovation efforts. 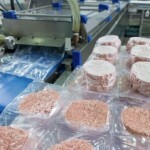 Meat packaging set for steady market growth in the U.S.